Clean up the voter lists before the elections! Donald Trump and Republican National Committee (RNC) need to immediately file federal lawsuits to compel states to remove all ineligible voters from voter rolls across the country in every single state. All non-citizens, dead people and multi-state registrations need to be purged, and they need to be purged now. If, as Democrats purport, there are no ineligible voters or any possibility to engage in voter fraud, they will agree to the process without any contest. If they refuse and challenge the suit, then where there’s smoke, there’s fire. Why would Democrats refuse to purge ineligible voters from voter rolls? Emails reveal Clinton campaign chairman John Podesta clear as day saying that when folks show up to vote, as long as they present a driver’s license and simply attest they are citizens, it’s okay if they vote. As if that settles the matter. That is shameful, but the truth is, we’re relying on an honor system to keep non-citizens from voting. Non-citizens need to clearly understand that it is a violation of federal law for them to vote, and if caught it will harm any hope they have of attaining citizenship. Sadly, the current honor system is anything but secure, instead it is a system that is ripe to be rigged as Democrat Party operatives openly admitted their intent to subvert the one person, one vote basis of American elections, a clear violation of equal protection. States need to be legally required to clean up the voter rolls, and where they refuse or local and state officials simply look the other way while ineligible voters cast ballots, they should receive the equivalent of a post-election colonoscopy to ensure that foreign powers and illegal voters did not influence the outcome. In a world where everyone looks the other way, and smart political operatives like Podesta openly discuss exploiting the vulnerability to free and fair elections. An honor system cannot work when one of the parties simply has no honor. Nobody knows how many non-citizens are on the voter rolls. The fact is, neither states nor the Federal Election Commission are required by law to verify citizenship when non-citizens register to vote, even though it is illegal for non-citizens to register. And states do not verify citizenship when non-citizens show up to vote, even though it is illegal for non-citizens to vote. That, even though states are required to maintain digital voter lists and purge ineligible voters, including the dead, felons and those who move out of state, from the rolls. But not non-citizens. They are somehow exempt from being purged from voter rolls. What a joke. Can you say rigged? 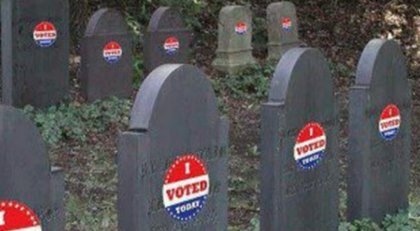 As for dead voters, there’s 1.8 million on the rolls according to Pew Charitable Trust, and 2.75 million registered in more than one state. They’re supposed to be purged. What’s the hold-up? As for non-citizens, the Public Interest Legal Foundation has discovered in just 8 Virginia counties more than 1,000 ineligible non-citizens on voter rolls, highlighting that the problem is likely systemic and nationwide. Something must be done. Investigative video shows Clinton operatives like Scott Foval openly discussing an interstate voting fraud plot where out-of-state fake voters are brought into states like Wisconsin to vote via same-day registration, claiming it’s been done for fifty years. This is a part of the secret history of Democrats stealing elections. What’s news is James O’Keefe managed to get an influential Democratic operative to admit how it’s done on camera. Groups feign outrage, and so Foval was fired from Americans United for Change, but he’s just an example of the win-no-matter-what mindset on the left. All of which proves why same-day registration needs to be banned and voter id and citizenship verification required nationwide. Enough is enough. It is the actions of these Democratic operatives that threaten the legitimacy of the electoral process, and for the left to try to cast Donald Trump as the villain because he is demanding clean, honest elections is an affront to every American who votes once and expects their vote to count the same as everyone else’s. Women and blacks have fought for the right to vote, against discriminatory poll taxes and other impediments, it must be a shock to their system to realize the level of corruption which effectively turns them into a fractional person by partially negating the impact of their vote. You know what to do! Let’s urge Donald Trump and the RNC to sue in court to compel states to remove all ineligible voters from voter databases to protect this one-person, one vote law and end the Democrats perversion and distortion of the law in a craven desire for power. It is time to force Democrats to defend the indefensible. This election is too important for the outcome to be in doubt. JamesHaurl J. from Sardinia, NY signed. This travesty of our election process must be corrected and prevented from continuing. Justin S. from Milwaukee, WI signed. Shawn R. from Malad City, ID signed. Arthur C. from South Park, PA signed. We need photo Voter ID Cards, if you don't have one you don't vote. Tired of Dem's crying racism when we push for Voter ID cards. Even in Iraq they had their purple ink stained finger to prove they voted, they couldn't vote twice. Robert K. from Orlando, FL signed.